The restaurant has closed. I am leaving the post up for reference only. 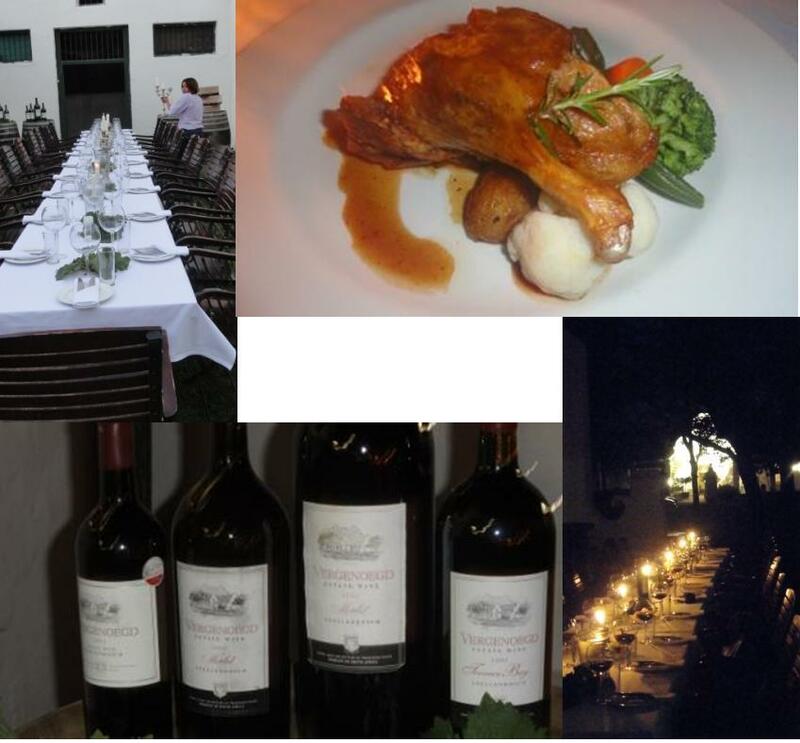 Pomegranate Restaurant is situated on the Vergenoegd Wine Estate and offers diners an al fresco or an indoor eating experience. The old house contains the restaurant and the wine tasting room and if you are going for lunch you should arrive early enough to enjoy the wines and port on offer from the estate. You will find the entrance to the estate on both the R310 and the R120 but be advised the road leading up to the farm is a dirt road. This Stellenbosh winery is owned by John Faure who has a fantastic way with his grapes, and his ducks! Pomegranate embraces his approach with a menu that is both simple in its outlay and extravagant in its tasting. This is a fine dining experience with personalized service from the chef. Chef Michael Israel is enthusiastic and you want to eat his words. There are no descriptions on the menu, so you need to pay attention when Michael explains each dish and as each meal is described in detail I have found that there is more than one dish on the menu I could eat quite happily. 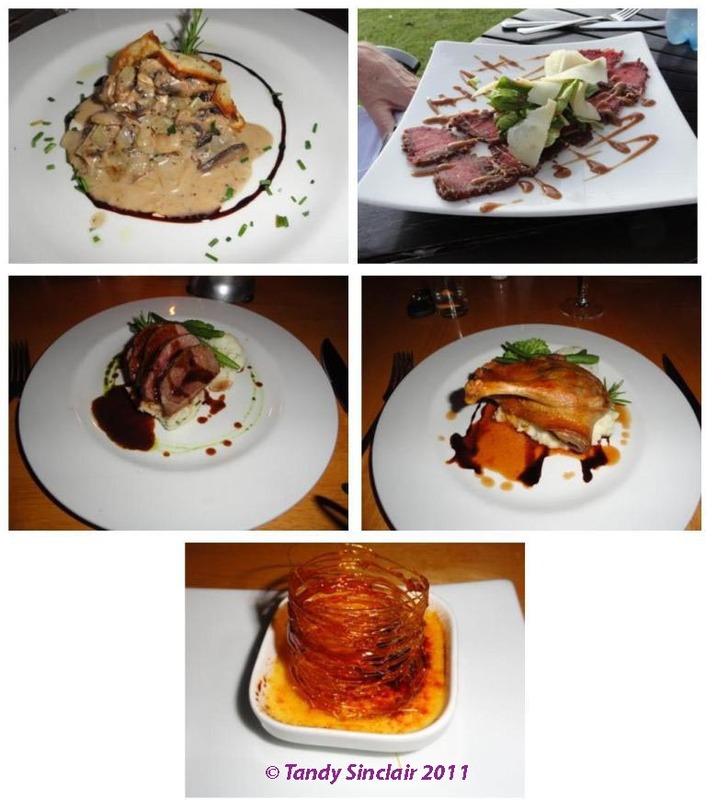 The mains are on the menu as game; fish; meat; poultry and vegetarian. I love this – it gives the chef scope to make use of fresh ingredients. Once Michael has told you what you can expect from his menu, service is handed over to well trained staff who are attentive without being intrusive. The wine list is very good and indicates the name of the wine maker of each wine which I think is a lovely touch. It is well priced, with the most expensive being the Meerlust Pinot Noir at R279. Service is excellent and this is a highly recommended eatery and one where both Dave and I are happy to go back to. Our evening started with a duck spring roll amuse bouche which was served with the Runner Duck Rosé. The wine has a lovely cherry nose and is made in the French style and is a blend of Melbec, Merlot and Cabernet Franc. Dave and I went to see the bottling of the 2011 vintage and it was quite an experience. The wine is lovely and dry and perfect for our approaching summer. The second course was oxtail served on a puff pastry which was a bit too sweet for me. It was accompanied by chips which got a big tick! 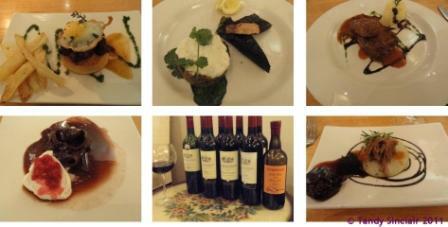 The wine paired with this course was the Bordeaux Blend which is their flagship wine. It is blended before being bottled, but after each individual grape has been barrel matured in its own barrel. Our third course of salmon was served with the Shiraz. The Shiraz is a Rhone style wine and despite me not liking lentils that much, the entire dish worked well. This course was followed by the most tender piece of eland I have ever had. It was dusted with licourice and served with the Cabernet Sauvignon. I found this wine a bit too heavy on the tannins and it would do well to lie a bit lingering in my ‘wine cellar’. Dessert was a white chocolate pancake which was served with the Merlot. Even though I love Merlot, John gave me a glass of the Cabernet Sauvignon to try and it was WOW! We are ordering this dessert for Dave’s 60th and we will be pairing it with the Cabernet Sauvignon as I was that impressed. Our last course was a duck rillette. This is a traditional last course for the gourmet evenings and it was served with their tawny port. The tawny port does not quite match the colour needed to be classified as tawny, but it has the correct taste. You can only buy this port at the estate, in a hand bottled and labeled bottle. It goes extremely well with figs! We had the most amazing evening. This was an amazing evening where we got to hear all about how the grapes are grown and how the wine is made. I should have taken notes, or at least written about it sooner. Next year we will go back for this special treat. Last year, on our way to The Duck Pond at Welmoed we stopped off at the Vergenoegd wine estate and stuck our heads into Pomegranate. I knew immediately we would be back to eat. My dream restaurant has a menu like their’s. And not only did the menu grab my attention, speaking to chef Abdus Paleker tantalized my taste buds. We made our first booking for the 16th of December and due to the public holiday, they were not open. We made another booking for the 18th of December but their electrical cables got stolen. We tried again, with the same problem but finally, we got to eat a meal there, and it won’t be our last. We were greeted with an amuse-bouche of Eland which was a bit chewy but given how small the piece was, this was not surprising. Bread was also served. For our wine we chose the Vergenoegd Runner Duck Red at R79 and it was more than pleasant! For starters I chose the mushrooms (R49) and Dave chose the carpaccio (R59). I got a lovely crepe with poppy seeds and a mushroom sauce that was so good, I wanted to lick my plate. Dave’s carpaccio was gemsbok. I would have loved to have eaten the roasted beetroot salad (R59) but it is served with goats cheese and for some obscure reason, I cannot palate it. Dave chose the confit duck (R129) for his main course and I had the eland (R126). I have decided that eland is not for me, but that does not distract from how lovely the dish was. Dave’s duck was awesome and I think I will have that next time we go. Desserts included crème brûlée and so of course that is what I had (R45). It did not fail to impress. It tastes amazing, so thank you! Great review. Love that dessert dish ..
I’m glad you finally got to eat there – it looks good. How nice it all sounds. I’m trying to get my hands on some duck to cook when you’re here, want to use the Verlaque Burnt Seville Preserve from my #FBI2011 goodie bag. What a beautiful crème brûlée.